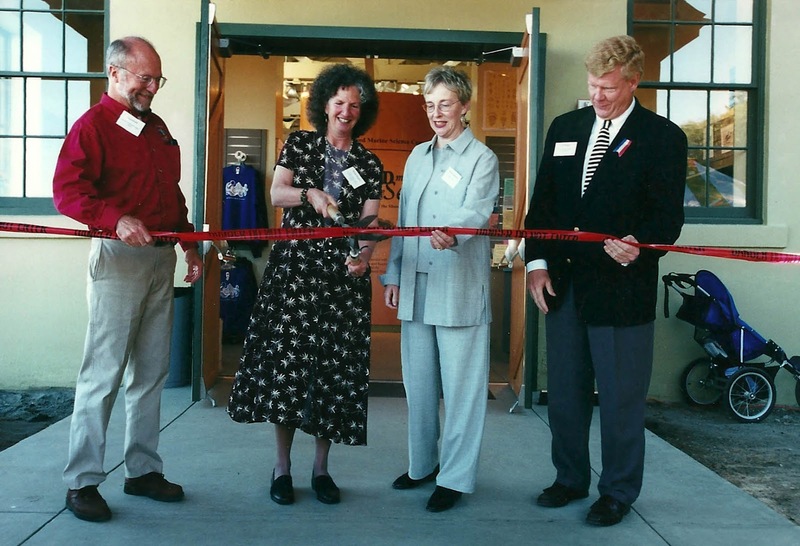 When Judy and Libby founded the Marine Science Center in 1982, they had no idea their dream would manifest so concretely, last for 30 years or have the impacts and the durability PTMSC is know for. Let’s imagine the next 30 years, because in a blink of the proverbial eye we’ll reach 2042. Will our touch tanks teach people how to ‘farm’ food, as well as teach about marine life? Will we be growing algae in our lab to demonstrate carbon sequestration? Will we learn to communicate with whales? Process that algae at PTMSC on Monday? Learn navigation and vessel handling on Tuesday since goods are being moved around by flex-fueled and sailing vessels? Work the land on Wednesday growing food year around and helping watersheds support a diversity of species? and on Fridays - contemplate, discuss, debate and create? Guess I better add Saturdays for civic affairs! Who knows what our world will be like in 30 years? We’ll keep on target, ensuring that the Science Center remains an integral part of the Salish Sea community, a hub for learning and for modeling sustainable behaviors … a place where old and young share, talk and make a difference so that orcas and humans continue to co-evolve in the Salish Sea. This is the final of our 30 stories celebrating 30 years. We hope these stories have illuminated some of our history and sparked your imagination for the future. We sure have had fun reminiscing and looking at old pictures. We invite you to make a contribution of $30 to celebrate 30 years, or increase your impact and give more. All funds support the Future Fund to keep the PTMSC going strong. Donate online or call (360) 385-5582, ext. 104, or send a check to 532 Battery Way, Port Townsend, WA 98368. In yesterday’s blog you learned how the community helped assemble Hope’s skeleton. Now you must be wondering - when can you see it displayed it in its full splendor and learn her story? The answer is very soon! 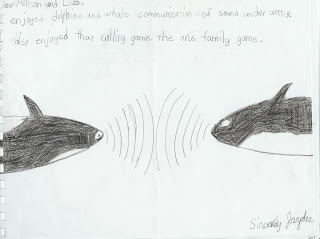 September 29 is opening day for a new exhibit we’re calling Learning From Orcas – The Story of Hope. We want you to be surprised so I’m not divulging too much, but suffice it to say you will be moved. Her story has joyful elements and deeply troubling elements. PTMSC has moved into taking a stronger advocacy and awareness-building position for Salish Sea health largely because of what we have learned from working with Hope. As we look forward to our next 30 years, we realize that the time is now to make a difference and we want all our guests to know they can have a role in turning the tide on the declining health of our marine waters. This exhibit will help you find your role. 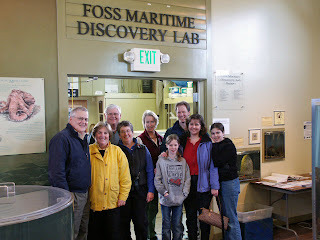 The Foss Maritime Discovery Lab opened April 9, 2005 in the Marine Exhibit located in the southern end of the exhibit and was named after its lead funding provider, Foss Maritime. “I look forward to the opening of the new Discovery Lab as Foss wishes continued great success in making the PTMSC an outstanding model for science education excellence,” said Gilbert Graham, vice president for Foss Maritime at the time of the opening. The lab continues to be used for research, environmental monitoring and culturing projects. 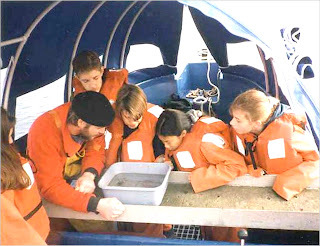 Over the years since its opening, kids and adults have deepened their marine science learning experiences through projects conducted in cooperation and collaboration with regional scientists and laboratories. If you asked any staff member, current or past, “What do the volunteers at PTMSC mean to you?” you would surely hear a deeply personal answer. We all know what it means to volunteer our time to one cause or another—however when someone steps foot into the Port Townsend Marine Science Center, the meaning of a volunteer experience is surely changed. Whether you are helping campers seine for fish at the Fort Worden beaches, sampling our waters for harmful algal blooms, inspiring visitors in our Marine and Natural History Exhibits, or responding to stranded marine mammal calls, the opportunities to contribute to the mission of PTMSC are endless. In order to celebrate and strengthen our volunteer program, PTMSC held its first-ever Volunteer Enrichment Series this past spring. Over the course of 2 ½ months, volunteers were educated, engaged, and challenged through interactive sessions on topics of interpretation. They discovered how to find their voice—how to inspire conservation in meaningful and personal ways. I had the pleasure of leading this series and was fortunate enough to see firsthand, just how dedicated our volunteers are to helping us fulfill our mission. Although I have only been around for a short while, that was all it took for me to develop a genuine appreciation of our wonderful volunteers. 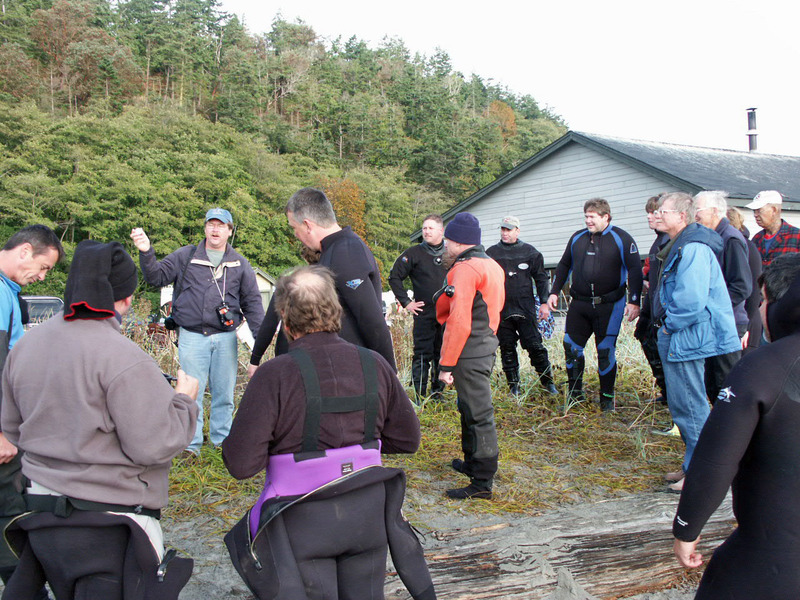 People from all walks of life dedicate their minds, hearts, and spirits to Inspiring Conservation of the Salish Sea. This organization could never stand as strongly as it does, it certainly would not have transcended the past 30 years, and would not be able to move into the future with passion and inspiration if it weren’t for truly irreplaceable and invaluable volunteers. A special thanks you all of you who volunteer from the PTMSC Staff. a rain cover was made for it. Back in 1986, Judy and her friend Debra decided to start a project that would get local kids helping to monitor the water quality in Port Townsend Bay. They already had a boat—a scientist friend had donated the vessel Monty Python to PTMSC. Debra was a water quality engineer, and Judy reluctantly agreed to be the boat’s skipper until a real skipper took the helm. 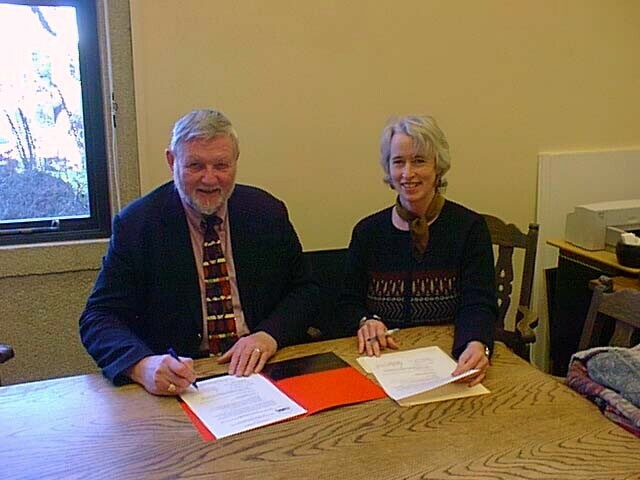 The Port Townsend Bay Monitoring Project, or MOPO, was born. 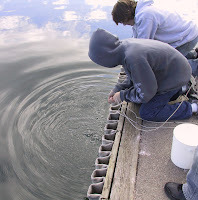 With six high school students in tow, they tried out many things that first year—sampling water from one end of PT Bay to the other, doing the first fish trawls, and testing bottom samples for contamination—tiny amphipods were placed in the sediment to see if it they died. (The test was tricky to do and results weren’t very clear.) 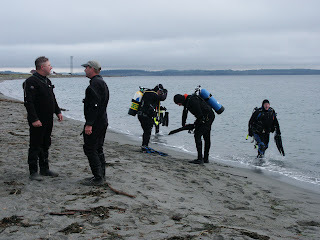 Volunteers were involved too, monitoring beaches for change and surveying eelgrass beds. MOPO continued for 14 years. After the first year, MOPO began working with all of Port Townsend’s 8th graders. 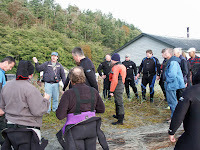 Students got some in-class training and then they each got a turn going on a sampling trip on the Monty Python. When it was their turn they were often annoyed they had to put on baggy rain gear and wear thick life jackets, but once on the water nobody complained. Over the years they measured dissolved oxygen, salinity and temperature at four monitoring sites and recorded the variety of animals they sifted from the sediment at each site. 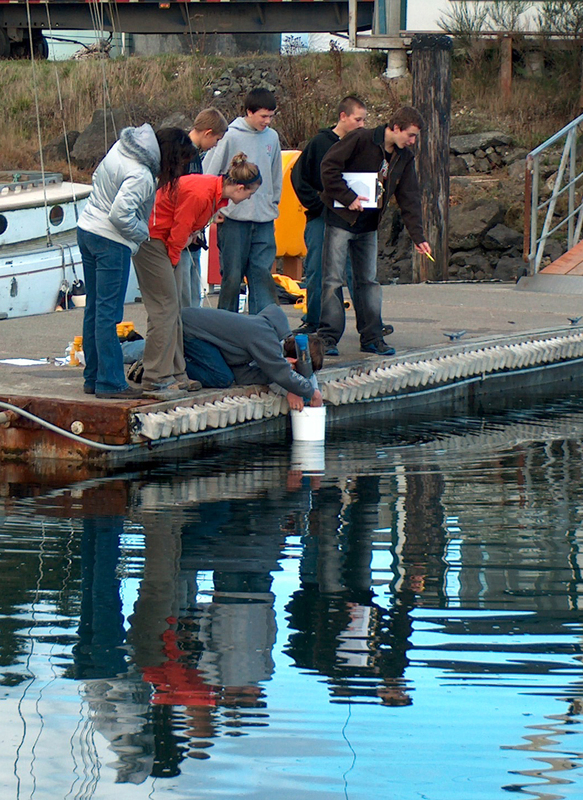 But the best part was that so many students—around 100 each year—got out on the water to work as scientists for a day and learn what good water quality is all about—and why it’s so important. 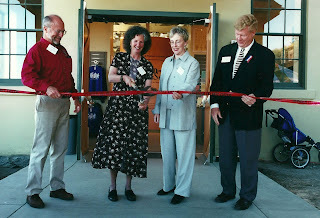 In 2000, the NHE building was an abandoned, poorly lit unused space with a rotten floor. 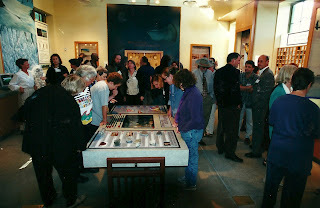 But we were in the process of planning its future exhibits and had our minds full of geology, glaciers and mammoths. Several of us thought it might be fun to have a giant mammoth in the Rhody Parade but we didn’t have the vaguest idea of how to make one. Enter Lisa Bottomley Mabelle, paper artist extraordinaire. One quick brainstorming session led to a small sketch which grew and grew and grew. 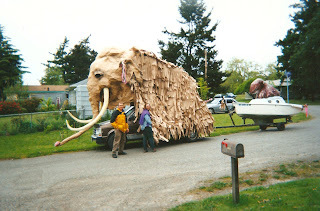 With the help of donated brown wrapping paper from the PT Paper Company, many volunteers highly experienced in tearing paper and lots of ingenious structure-building by Lisa, a magnificent mammoth emerged that fit perfectly over Richard Inman’s van. 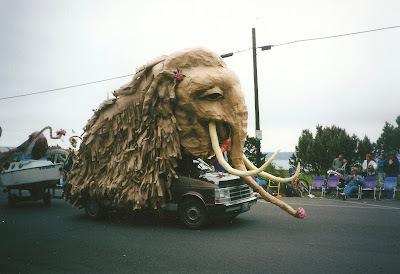 Since the mammoth “hair” obscured the van’s windshield, driving it in the parade required navigators walking on both sides of the van, to make sure no one was run over. After the parade, the mammoth was fed into a bonfire, to make it truly extinct. Biology has a certain smell. In the case of marine biology it’s a very distinctive smell indeed—salty, fishy and sometimes overly pungent, in the case of marine mammal parts or the unique scent of low tide. When you crack the freezer open at PTMSC, you are sometimes hit with all of these smells at once. 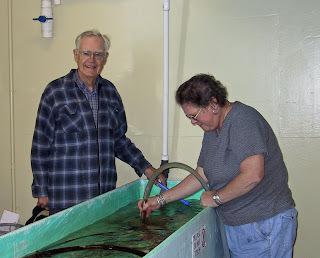 Our freezers serve many purposes—they hold clams, krill, herring and squid for feeding our animals, whole tilapia used for fish printing, plankton samples collected by our citizen scientists and a bunch of rather unusual specimens stored for various purposes. There is a set of baleen plates from Spirit, the gray whale on display in NHE. A wide variety of fish specimens stored for later drying and use as educational tools. A river otter, Northern fur seal, and several small birds await the opportunity to be cleaned up and shown in a display or class. Two seal pups are on hold for future trainings on marine mammal strandings. Last year we stored a whole orca flipper until we could to have it scanned to accurately map out its bones for re-articulation. 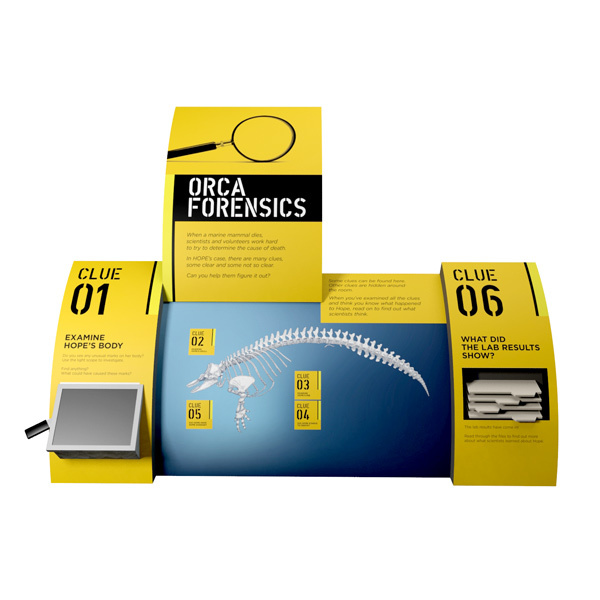 In past years it was the rare Lancet fish that washed ashore, Humboldt squid collected by local fisherman, and an occasional dog fish shark that was saved for a dissection demonstration. If those freezers could talk, they would tell the story of questions wanting answers and riddles waiting for their turn to be solved. This is the central idea of marine science—that the questions are more plentiful than the answers. Answering these questions is often a hands-on (and potentially smelly) investigation—which all starts in the freezer. These are the folks who haven’t been afraid to take the plunge (with their hands, that is!) 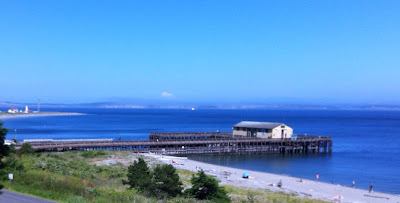 and help with the care and feeding of all the wonderful sea creatures living in the Marine Exhibit touch pools and tanks on the Pier at Fort Worden State Park. Ask any volunteer who’s helped on Home Crew and you’ll hear stories! We’re hoping some of you will add them below as Comments. 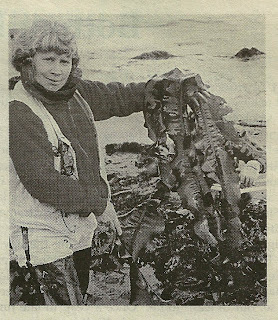 From 1996-1998, PTMSC conducted a citizen science study in collaboration with local biologist, Dixie Llewellin, at Kinzie Beach in Fort Worden and at nearby North Beach County Park to learn about impacts associated with recreational seaweed harvesting. 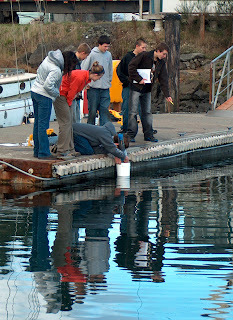 As with all our citizen science projects, a secondary focus was to involve volunteers in learning more about the marine environment through data collection, observation and recording. 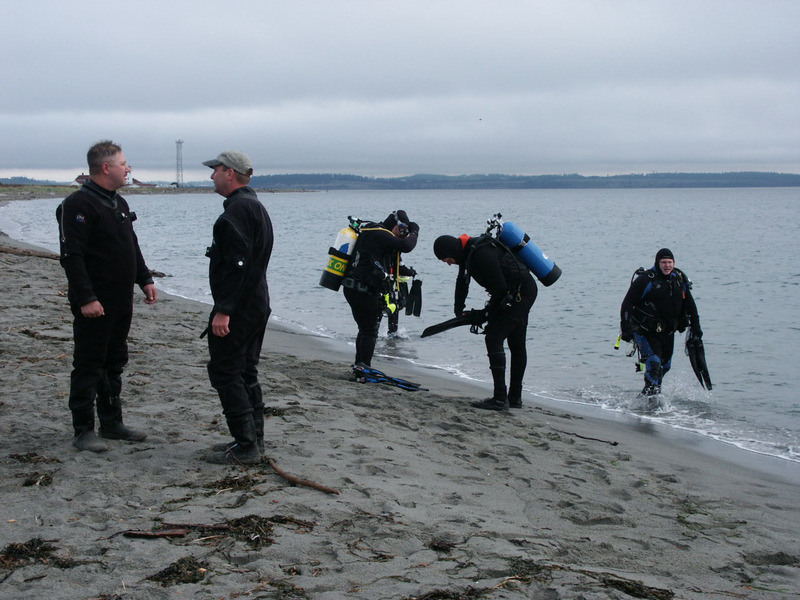 As a 3-year project, volunteers had the chance to really get to know the beaches they were sampling, from the tallest bull kelps down to the hiding, camouflaged animals. So what do you think the volunteers remembered most about the study - the results? Nope. "After two seasons, I began to understand the seamless web linking snail and seaweed, chitin and crow, squid and scoter. My mind’s eye is sharper. 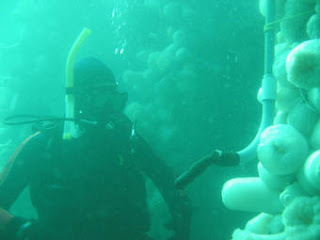 The health of the seaweed and the lives dependent on it connect to the larger environment and me." "The seaweed study provided an antidote to the six o'clock news. A sense of connectedness." "As an observer, I was surprised to learn how much over-harvesting was taking place at North Beach. I realized the need to place limits on harvest of this important resource." "It was at once the most fun and profound project I have ever joined." The results were, of course, important for the volunteers conducting the project, but it's clear that a citizen science project of this sort has tremendous value in building stewards and advocates for the marine environment. 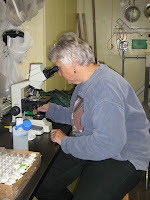 The study was also very popular because volunteers were able to spend hours on the beach.